I love working at different kinds of venues as much as I love working with different kinds of brides. But be sure to do your research & homework before you fall in LOVE with the venues that provide nothing but space. These venues will promise privacy, intimacy and even offer you an empty space to be creative & flexible with the floor plan. I don’t want to talk you out of having your wedding at a private estate, because I L-O-V-E THEM, but I do want to give you a heads up on some things you should consider before you book at such venues. The sky is the limit, you can get creative in what you want to do with the décor, and there is flexibility in choosing your caterer as well. If you want to have a hosted bar at your reception, you may be able to save some money by bringing your own alcohol. YES, this may all sound amazing- but please be aware that there are TONS of restrictions to what you can and cannot do. Rentals: Yes, it seems obvious that you would have to work in rentals into your budget, but did you know that rentals alone can cost up to (sometimes more than) $100 per person! Don’t forget to include EVERTHING that each of your guests will need. This may include: chairs, tables, linens, forks, knives, dessert places, bread and butter plates, coffee pots and cups, martini glasses, rubber mats, serving trays, etc. The list goes on and on and can get to be very expensive. More Rentals: If the private estate you are planning your reception at does not allow your caterer to cook at their kitchen (95% of the time they will not), you are probably going to have to rent additional items like convection ovens, heating racks, fryers, prep tables, trash cans, and astro turf to protect the floors of the venue and for the safety of the staff working. Parking: Most homes do not have space to park 100 cars, and unfortunately there is no way around that. You should plan on spending a couple hundred dollars to rent a nearby parking lot to accommodate all of your guest’s cars. Valet or Shuttles: If the parking lot is not easily accessible to the ceremony/reception area your guests will need additional transportation. You may want to hire a valet service to take the guest’s cars to the parking lot for them. Or, hiring a shuttle service is another option that is worth looking into. These services usually start at $750 to $2500, cost depends on how many people are on your guest list. Lighting and Generators: A lot of private estates, especially homes, are not designed to host parties with a guest list of over 200 people (unless they are specifically designed too). They should have track lighting to light pathways, and maybe enough power to run a small sound system, but most likely they will not have enough light or power to run the event throughout entire evening. I recommend visiting your venue during the time you want to have your event so you will have an idea of the type of lighting and power you need. The last thing you want is to have your guest eating in the dark. Once you decide the amount of lighting you want, you need to make sure that there is enough power to keep your lights going throughout event. Also, check with your band, DJ, and caterer to determine how much additional power is needed. Insurance: Yes, Insurance. Private estates will usually not allow you to use any vendors without insurance and a valid license. Did I mention that you MUST purchase liability wedding insurance of your own as well? Lastly, hire a wedding planner. Planning a wedding at a private estate/venue also comes with an endless list of things that need to be done. Including double and triple checking your rental orders, power needs, making sure the valet/shuttle service is running smoothly, faxing the signed rules and regulations from each of your vendor, etc. Don’t get overwhelmed by all the logistical matters, its stress that you don’t want to deal with the day of your wedding. I definitely think that having a wedding at a private estate/venue is worth the extra work! But, make sure you do your research and homework before you sign and book a date. As much as I am tempted to show off all my clients' beautiful photos, there are some clients who wish to keep their photos private. Some clients don't feel comfortable having photos up on the web for anyone and everyone to see, especially nowadays with the nature of blogging being so open to the public. It is also written in my contract that I do not utilize photos taken during the event for publishing, blog/web, and advertisement purposes WITHOUT the bride and groom's consent. Before my business and getting my name out there, my clients' privacy comes FIRST and I completely respect their decision for keeping the photos to themselves. So many photographers, florists, videographers and wedding planners blog these days, but have you also considered your clients' privacy? Isn't she just stunning? Classic, elegant & graceful all around.. Even though I am “working” on the wedding day, I am always filled with so many emotions. From the moment that a client hires me, I become emotionally invested in my clients. Julia Chris' wedding is a perfect example, Annie from Varland Photography did an amazing job capturing an incredible moment that was filled with so much emotion and joy. This is a picture of when they were exiting the church. Julia was tearing up and when I saw her, I immediately teared up too because I knew how much hard work went into planning this wedding. Different thoughts were running through my mind as I watched her cry; a feeling of huge relief, joy, excitement and thankfulness. In the midst of disagreements, miscommunications, and discouragement from all around, the couple did an amazing job incorporating both different traditions and religions. It wasn’t an easy process, but from the beginning I saw how Julia dealt with each situation with grace and kept her cool, I was impressed and inspired by her thoughtfulness and character. The ceremony ended beautifully. Not a dry eye in the room, we all felt the love that the couple shared and were honored to witness their ceremony. I had a surprise waiting for me in my inbox last weekend from the mother of the bride. The following is a part of the e-mail she sent me- it meant so much to hear from Julia’s mom. Oh and on a side note, Julia’s mom put together all the floral arrangements for the wedding- 24 centerpieces, 2 alter arrangements, 8 pew arrangements, and all of the bridal bouquets and boutonnieres! She did all of that and still and looked absolutely gorgeous for the wedding! Part II will be coming soon- there is a lot that I want to write and share about this couple. I love Angela to pieces! She is the sweetest, caring & thoughtful person I've met in Nor Cal. It's been almost seven months since they got married and I still regret not attending the wedding!! Her wedding photos are so full of life- so many emotions are captured in these shots that I had to share some of them with you readers. Huge thanks to Susan from En Pointe Photography for capturing Angela's contagious smile & Kenny's unconditional love for her. Seriously... NEVER NEVER skimp on photography! One of my favorite shots.. This shot is making me cry too! If you want to add something fun to your cocktail hour or reception, think of doing an old fashioned soda bar. Information was taken from the Project Wedding Website. Old fashioned sodas add a fun and playful element to an event and can even be used as part of your decor! There are so many to reasons to love them: they are in pretty glass bottles, lots of times with original vintage-y logos on the packaging, and they are made with pure sugar cane, delicious! Plus you'll hear your grandpa excited when he finds his favorite soda from when he was nine! We love them all set up arranged according to color or you can even just buy the color of flavors that go with your wedding. Instead of keeping them on ice, refrigerate them up until right before and line them up on a table or bar for maximum effect. The hardest part of having old fashioned sodas is sourcing them. They can be difficult to come by. If you live in California BevMo has a very large selection of specialty sodas (and even ships them online if you can't find something local). Gourmet delicatessens and stores can also have good selections and we've even got lucky before at warehouse stores like Costco. Add some fizz to your wedding day with gourmet sodas! Gloria & Matt tie the knot! Gloria & Matt tied the knot last month at Terranea in Palos Verdes. It was Terranea's 3rd wedding since the grand opening and all the staff were simply amazing to work with! It's a huge property and I literally got one month's worth of exercise done in one day! :) I remember coming home feeling extremely exhausted, but I give major props to ALL the vendors who have worked so hard to make this wedding possible. Managing over 300 guests is not quite easy, but everything flowed perfectly as planned (well.. there were some few mishaps like the cake delivery guy getting lost on his way to the resort, arriving 2 hours late. Thanks Kerim from My Wedding Blooms who stayed an extra hour to decorate the cake. He really went above and beyond!! He is simply the BEST! I know how hard he worked to decorate the trellis because it was very windy to start off, but he & his staff did an amazing job and I simply cannot rave more about his services! Gloria's down to earth, charming & caring personality sold my heart instantly! She's a true beauty inside & out! The girls looking so fresh & cute with their tangerine dresses! Loving this shot of the couple! Isn't the view just gorgeous? Don't they look so happy? I loved working with this couple! Serving the teas to the parents & Matt's grandfather! Top notch food presentation! Oh how I loved their strawberry shortcake for dessert... YUM!! Now onto some photobooth action.. Gloria's sister, Jane surprised her with renting the photobooth as a gift! Time sure does fly by these days and today, I wanted to blog about something very important before I head off to Nor cal. Every wedding is uniquely planned by the bride and groom and this ceremony is a tribute to Julia & Chris as they appreciate the differences between their traditions. It joins their cultural traditions and symbolizes their wonderful commitment of honoring their very different heritages. It has been a long planning process as three of us have gone through in selecting appropriate Christian, Korean, and Jewish elements so that EVERYONE can take part and understand. Every word and technical term & order of the program have been carefully reviewed and selected with much consideration. And I'm quite pleased to let you know that it will be one beautiful, touching, & meaningful ceremony as the guests witness and celebrate one of the most unique weddings ever! To those who are also planning a multicultural and interfaith wedding, here's a sample of the bilingual order of ceremony we have come up with. Hope you find this ceremony resourceful and inspiring as you plan your own unique wedding. 유대인 혼례예식와 한국식 전통 혼례예식을 같이드리고자 하옵니다. 서로 다른환경에서 자란 신랑신부가 한 몸 이뤄 새가정을 꾸미는데 종교와 문화의 차의점을 양해해주시고 이처럼 뜻깊은 행사의 동참하셔서 축복해주시길 바람니다. First off, Rachel is one of the craftiest gals in the blogosphere. If you’re in need of a little modern, down-to-earth Martha in your blog life right now you must visit Heart of Light. Quality ribbon - as wide as you’d like your belt to be. We used 1.5 inch grosgrain for our project, but you could certainly use a pretty double satin or something else entirely. Just make sure it will lay nicely on your waist. Fabric - We used four different types/tones for this project. 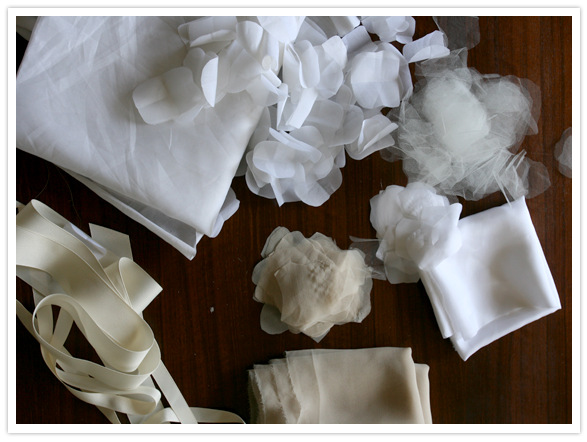 Rachel chose a few different silks and a tulle. Different textures and weights make for nice variation when they’re all mixed together. The remnants bin of your local fabric store is a great place to start if you’re looking for inspiration. Find the center point of your belt/ribbon and start there. We’d recommend cutting your belt longer than you think so you can accommodate for an off center finished product and/or for a big bow in the back. Make your petals. Again, how-to is on Heart of Light. 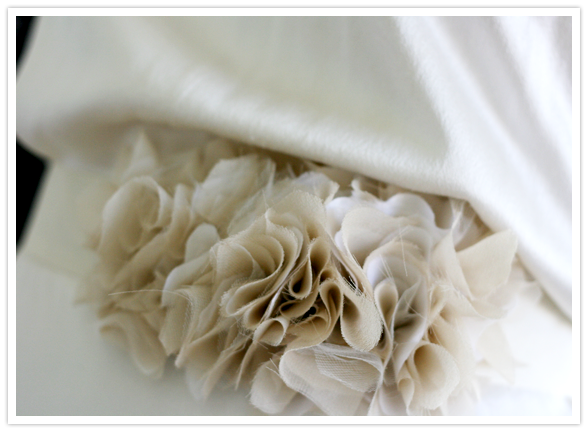 Stack 2 or 3 petals on top of each other (using a variety of fabrics and colors in each flower). 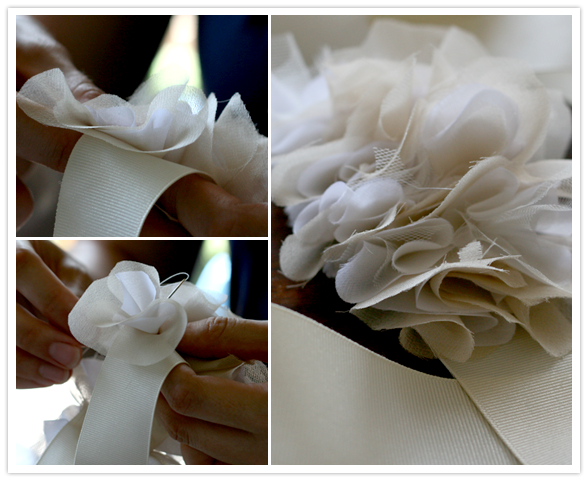 Twist the back of each flower so you catch the center of all 3 petals and lay it on your ribbon. Now tack it down with a few well placed stiches and repeat. 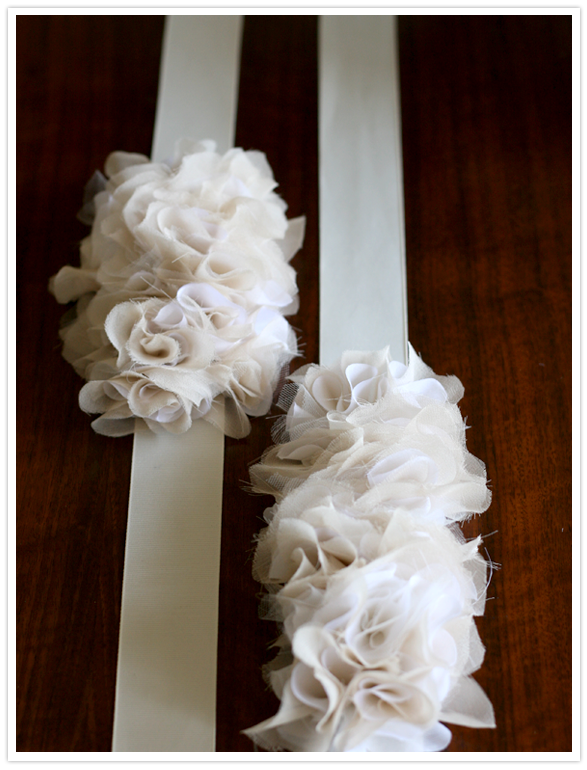 If you’re using a wider piece of ribbon like we did, you’ll need 2 flowers, side by side, per row. Working in one direction, add as many rows as you want to make the decorative part of your belt the right length. Once you have the general shape and length that you like, you can always go back in and add more flowers where you see fit. This project is especially excellent because it requires little expertise in terms of sewing. As long as you’re familiar with a needle, thread, and a basic stitch, you are completely qualified to pull this off. Once you’ve filled your belt with the number of ruffles you like, that’s it! The underside won’t be pretty, but don’t worry. No one’s going to see it. 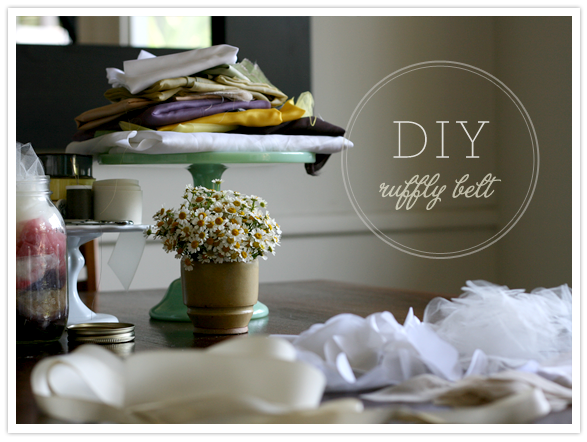 For a more finished product you could always back your belt with a second piece of ribbon. We can see this project working with just a little flower for your hip or with a full row to accent your entire waist. Totally depends on you! We’re making more of these, that’s for sure. 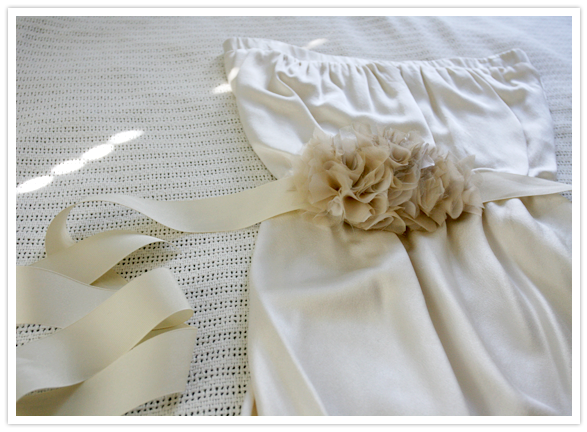 And seriously, they are so simple you could easily make a whole set for your bridesmaids.